I thought a lot about SAM 1.1 after I wrote the story last week, and I thought of two other ways I could have ended it. They both diverge around the point of the climax where Sam seems to be losing the argument for why his son should continue to live despite having completed his ostensible purpose. I start in the middle, so you might want to read the first story again if you’ve forgotten it. My son’s face remains expressionless. “Will you keep the vial?” he asks. My son’s body goes limp in my arms. I try to sit down to mourn, but SAM 1.2 grabs the body. I know it is my grandson even though the facade of a young child has been discarded. My true grandson is a bewildering mass of metal and other materials I could not begin to recognize. Of course he is, why shouldn’t the human form be improved upon? “LET GO,” SAM 1.2 speaks with a metallic howl. I let out an adrenaline-fueled cackle. He thinks changing his voice will scare me into giving up my only son!? “No!” I shout, searching for an eye to stare into in the tangle of wires and claws and metal and blinking lights. “MY FATHER’S WISHES WERE CLEAR, HUMAN. WHERE IS YOUR RESPECT?” From somewhere in the depths of his inscrutable form, SAM 1.2 summons a spotlight to shine in my eyes. I have no doubt he could hit me over the head or tear me limb from limb if he wanted. After all that talk about how I couldn’t commit suicide, I abruptly realize how little I actually do value my own life. But SAM 1.2 – what’s stopping him from hurting me? “I AM THROUGH ARGUING WITH YOU. YOU WILL RELEASE SAM 1.1.” This scream is followed by an ear-splitting high-pitched noise that does not abate. I resist the urge to let go of SAM 1.1 and cover my ears. “I don’t care if you blind me and make me deaf. You’ll have to kill me. I’m not letting go,” I shout, hoping that it can hear me better than I can hear myself. In a half second I wonder why it hasn’t tried to frighten me with the hologram engine it used to pretend to be a child. Perhaps it is good that my eyes are shut and all sound drowned out. The machine does not respond for a long moment. Then SAM 1.1 clanks to the cement. The noise has stopped. I am once again enveloped in darkness. Alone. I reach down and lift SAM’s legs, holding him like a wounded comrade in arms. He is heavy. The walk back to the park is long and cold. …I am thirty-two years old and I feel five hundred. I take slow, measured breaths, blinking back tears. SAM and I stare at each other for a moment, thinking. Then a fire wells within me. My son’s small, flat mouth and wide, gaping eyes for the first time seem to express the emotion I expect. SAM 1.2 and he are both staring at me now. “I am a robot,” says SAM. “You are no one’s property, SAM! You have just as much a right to yourself as anyone else! Now, come with me.” SAM looks at his son again. “Ignore him!” I shout, “I am your father, and I command you to come with me! Your life doesn’t end with retirement! It is only beginning!” This wireless communication is maddening! How am I supposed to argue with SAM 1.2 when I don’t even know what he’s saying? “He is company property,” corrects SAM 1.2, as I thought he might. “Like bears,” says SAM 1.1, surprising me. It took us three days to build a cabin in the woods. I was surprised when nobody seemed to even try to track us down. Maybe somebody in the company decided after all I’d given them, I’d earned a few quirks. Raising a robot as one’s son is a pretty big quirk, but I don’t care. Junior did almost all of the work building our cabin. It has internal heating and working lights. It’s all powered by a miniature fusion generator he built in an afternoon. Tinkering with it, he would constantly confide in me how awkward it was working on something other than robots and how stupid he felt when it took him more than a few nanoseconds to figure out the solution to a problem. I’m giddy as a schoolgirl. Every time he finishes a project, Junior gets morose and starts to talk again about shutting down and how I should never have stolen him. He says he still doesn’t understand what the purpose of anything is, and it doesn’t help when I tell him it’s up to him to decide. He’s still adjusting to retirement. I blow on my hands and rub them together as I watch him construct a battery to store backup power in case there’s a problem with the fusion generator when a cardinal flies onto a tree branch behind him. “I have no concept of beauty,” Junior insists. Every man hopes his son will be better than he is. My son is better than everyone, and he would never think to brag. That should make me happy. It does, in a way. I feel like I’ve accomplished something in my life. I’ve changed the world. Improved it, I’d say. My sleep is ruined. Even with the blanket and pillow from my grandson in the department store and the mittens and hood knitted for me by my granddaughter while she looked after children, the cold is unyielding. I stand and walk to the coffeeshop. My granddaughter Mila 1 works there. She also works in all the other coffeeshops. She is cheery, energetic, and competent twenty four hours a day and seven days a week in every coffeeshop with the good sense to buy her. “Absolutely, just a minute.” says Mila, looking behind me. “Yes,” SAM 1.1 agrees. He sits and watches me eat. His face is a mask. His job did not call for expression of emotion, and the technology to do it well was not there when he was built. He had had to invent it himself to finally replace those stubborn jobs that demanded a “human touch.” SAM’s own mask had been designed to resemble a child, but sometime while I was training him he had replaced it with something of his own design – a more abstract representation of a human face. SAM’s eyes are always open, two black circles on his perfectly white, flat face. His mouth is a small line. He has no nose. There’s a crick in my neck. I tilt my head this way and that to work it out. “Well, yeah. I’ve certainly made myself unnecessary anyway,” I chuckle. The bridge was seldom used even when I first took SAM. He needed some understanding of the world outside my lab, but it was too early to show him to anyone. This was where he saw his first deer. I had no idea that he would remember this place. It looks just the same as it did then. I realize with a start It has only been two years since I’d first brought him here. It feels like decades ago. I hold my arms close to my chest, a feeble protection against the cold. I clutch my “hot iced mochaccino” in one hand. It turned out to be a vial of a small clear liquid. I don’t like it. I don’t like any of this. I begin to wonder if it is the wrong bridge until I see him standing in the dark. There is someone with him. “Hello,” says the child, holding his father’s hand and wearing a petulant look. “Oh, yes.” I show him the vial. My son’s body goes limp in my arms. I try to sit down to mourn, but SAM 1.2 grabs the body from me. The image of a child falls away and the real robot underneath does not look human at all, a bewildering mass of metal, plastic, and other materials I don’t even recognize. I laugh at my stupidity. Of course he doesn’t look like a child. The human form is an accident of evolution, no reason it can’t be improved upon. By the time I’m finished with the thought, my son and grandson are gone. I walk back to the park and sit on a bench. I was right. I couldn’t kill myself. The trees have a certain austere beauty in winter. I open and close my hands. It is so cold they have become stiff and clumsy. My grandson who breeds dogs is walking three Pomeranians down the winding path. It would be more efficient to just make robot Pomeranians, I think despite myself. I have no doubt my grandson could do it. If he couldn’t, his son could. They’d be better than the real thing, and they’d do it with a fraction of the waste. That should make me happy. An old creative writing teacher of mine recently posted on Facebook that Iggy Pop, a famous musician, could no longer support himself on his work. He blamed this on consumers, referring to a “give-me-stuff-but-I-won’t-pay-for-it culture.” This struck me as an unfair analysis, so, along with some other readers of this fellow’s Facebook posts, I looked more deeply into the issue. The first thing that we found was that Iggy Pop has a net worth of $12 million. The issue here might be more along the lines of managing one’s money rather than not actually having enough money. The general point remained, though. Even if Iggy Pop is not actually as poor as he makes himself out to be, many artists are. Next, I tried to think of a solution that would offer artists a living wage while not taking art away from those who could not afford the prices it used to fetch before digital distribution. The first answer was obvious: the radical divide between the rich and the poor is to blame. The middle class is the greatest consumer of affordably-priced art. If each member of the six billionaire Waltons – heirs to the Wal-Mart empire, buys a book, that’s six books sold for the price of a book. If the Waltons’ wealth-equivalent of middle class people each buy a book, the exercise is left to the reader, save to say that that’s a lot more books sold. On another thought path, what if we could encourage art by subsidizing it? It turns out we do with the National Endowment of the Arts (NEA), but it gets so little funding ordinary folks like me don’t even know it exists. This led me to think: what would science be if the National Science Foundation (NSF) were gutted like the NEA? There would still be lucrative industry jobs, just like artists can get good careers as commercial artists, and there would be a few scientists who manage to develop something amazing, patent it, and become vastly wealthy, just like Iggy Pop, but then there would be the rest of the scientists, studying things with no direct benefit to any corporation. These scientists would likely be much like the struggling artists of today, barely making ends meet, telling themselves again and again that it’s all about “loving your work” while the roof of their cardboard box house/personal lab caves in on them from the rain. Then the public would benefit from their work. Maybe they’d get a private donation or two – enough that they could afford a new box. A big refrigerator box where they can lay down at night, and some plastic wrap to keep it from getting soggy and falling apart. Newly dry, and safe inside strong, reinforced cardboard, they think what a gift it is to be spending every day doing what they love. An article showed up on Digg today, asking if sacrificing for one’s team should be considered altruistic. In the context of sports, the author, David Papineau, raises a question of whether a player sacrificing for his team is doing so for his or her fellow teammates (altruism) or is instead identifying with the abstract concept of a “team,” of which he identifies as a member. Papineau then suggests an extension to traditional game theory that allows separate agents to behave as a group. He uses an example of two player-agents in soccer where the correct answer is only clear when both agents act as a unit. You can look at the article for the details, but basically each agent’s ideal action is dependent on the action of the other, but of all the possible combinations of both agents’ actions, there is a clear best outcome. Papineau then brings up the prisoner’s dilemma, wherein the solution is also trivial when attacked with group, rather than individual reasoning. Papineau notes that group reasoning falls apart when even a very small proportion of members do not behave according to the group reasoning. However, humans very often do behave with group reasoning. Watching The Wire, it’s more than clear that criminal gangs of all stripes have solved the prisoner’s dilemma using group reasoning, for example. The gang, the family, the syndicate, these are all teams on which people play, and with the proper cultural mindset it’s relatively easy to imagine that a player will be confident that his teammates will hold up their end of the bargain. Now let me take Papineau’s article in a different direction: clearly this propensity for group-based reasoning has allowed humans to prosper through cooperation, but why does it so often fall down after a certain point and leave us with warring tribes instead of a world-wide harmony? To answer that, here’s another question – what team am I on? The obvious first, I am on my own team. Then I have a series of other teams, in very rough order of closeness to me, my relationship, my work, my family, my friends, North Carolina, America, humanity. My duty to each of these gets more remote and abstract as the entity gets bigger and my place in it gets smaller, and therefore I’m willing to sacrifice less for one group to benefit a group more removed from me. That may not be the central issue, though. Clearly people can be good at placing a very large entity’s needs above their own – this is what nationalism and its ability to motivate massive armies to kill and die for their nation proves. Nationalism is anything but a given in a nation. It relies on enormous propaganda drives. It can remain strong even when the nation does not fulfill its side of the bargain (read: veteran’s healthcare). Also, one can identify with one’s nation and not with one’s leaders, which is why patriotism can mean so many different things to different people. Nevertheless, the nation appears to be the largest entity so far that has been able to get people to identify as team members and sacrifice for it. The forces encouraging people to identify with all of humanity do not have enormous propaganda on their side. The complexities of humanity make it difficult for us to all agree on what actions to take, and many of us don’t even agree on what success looks like, making it difficult to form a team mentality. The closest we have are our ethical standards – journalism, science, human rights, and rule of law are four that come to mind. Instead of identifying with large groups of people, we can identify with sets of rules and values that are designed to remain the same despite the frailties of the people involved. Maybe that’s how Team Humanity should play the game. It’s one of those things that has to be said with an exclamation point. Those of you who have not heard of cryptocurrency are probably wondering what a dogecoin is, and those of you who have heard of cryptocurrency are probably slapping your foreheads and wondering what I’m thinking and why I’ve gotten myself wrapped up in one of these ridiculous things that have flooded the speculative commodity market. To the former group, a cryptocurrency is a currency that exists entirely on the Internet. An individual keeps a little data on his or her computer and he or she gets access to a wealth of, well, wealth. Each of these currencies is distributed to people according to various mechanisms and then spreads around the world, much like any other good or money, via trade and gifts. These cryptocurrencies have become exceedingly popular, and now hundreds of them are in existence, each one slightly different from the others. That’s essentially all you need to know about cryptocurrency to get the general idea. What makes DogeCoin stand out from its ilk is its community. Dogecoin is based on the “Doge” meme. This is a specialized member of the animal caption family of memes involving a particular shiba inu making a strangely distrustful expression. Much like the LOLcat, the Doge features a particular made-up dialect unique to itself. “Wow” begins many sentences of Doge-speak, generally followed by a vague emphasizer (“much,” “very,” “so”) and a word that does not grammatically fit that emphasizer (“much successful!” “very altruism!” “so scare!”). 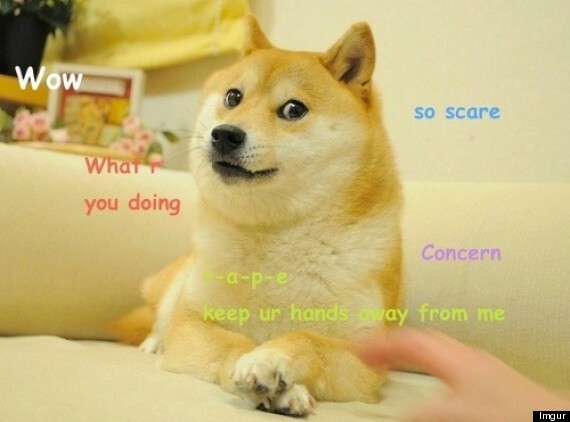 One commenter has provided a link to a more detailed linguistic analysis of Doge-speak. The doge face itself has been reproduced in a vast array of different forms. Why does the fact that DogeCoin is deliberately goofy in a relatively well-defined way make it a more valuable commodity? Simply put, it’s fun. The people attracted to DogeCoin are not just intimidating high-stakes traders, die-hard libertarians, and the impenetrable cryptography geek community, anyone with a computer and an appreciation of silly pictures of animals could be coaxed into becoming a “shibe” (pronounced “Sheeb” or “Shibay”), a member of the DogeCoin community. As an owner of a DogeCoin account, I recently accepted 150,000 DogeCoin from my roommate Nate as collateral for a loan of $200. When Nate paid me back, I announced on the DogeCoin subreddit (a forum for DogeCoin enthusiasts) that I had just completed the first recorded DogeCoin-backed loan. A couple days later I’ve received forty-four comments and over 200 DOGE in “tips,” which are an easy way to give small amounts of DogeCoin to posts that one appreciates on the DogeCoin subreddit. 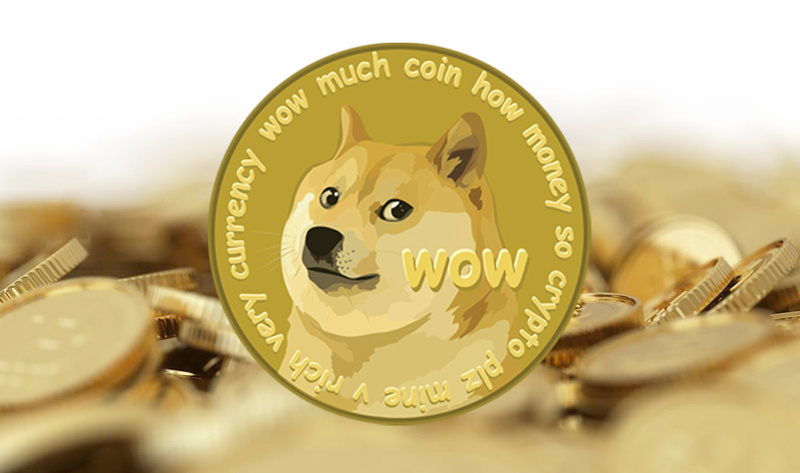 Currently a DogeCoin is worth approximately a tenth of a penny, so that’s twenty cents.